Gerry (pronounced Gary) has played the oboe for more than 45 years. He has been a member of several area musical groups including The Pacific Crest Wind Symphony, The Vancouver Symphony, The Oregon Symphonietta, The Southwest Washington Wind Symphony and currently plays with the Mount Hood Community Pops Orchestra and The Rivercity Oboe Trio. 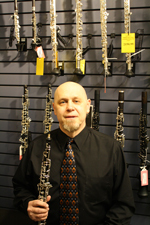 Gerry teaches students at all levels on both Oboe and English Horn. He also teaches beginning cello and guitar, primarily acoustic guitar, specializing in finger-picking. He has also worked in the recording industry since graduating High School in 1971. If you have a question for Gerry, or wish to contact her, please fill out the form below. The message will be passed along to the Education Center and they will get back to you.